The Manipular Formation was adopted by the Roman Army about 315 B.C. after their use of the Phalanx on uneven ground proved to be a liability against the Samnites. Analyzing the battle, the Roman commanders realized that infantry units needed to be broken down into smaller parts for better maneuverability. 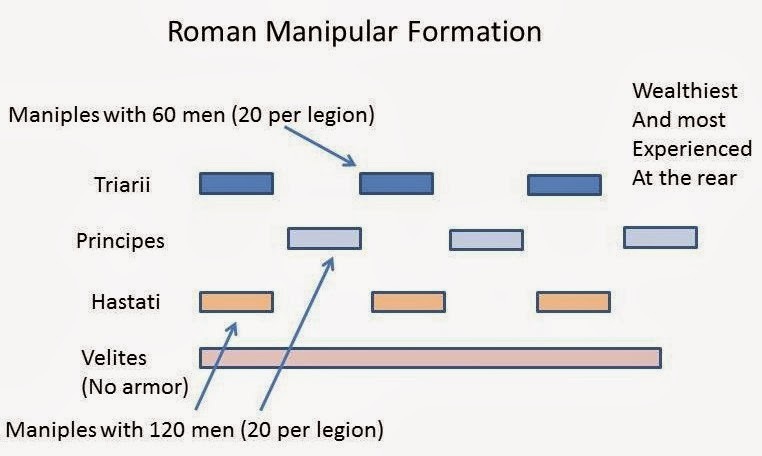 The graphic below shows how the Roman commanders created a new model for infantry deployment. Each legion was divided into three fighting types: Hastati, Principes, and Triarii. Hastati were closest to the enemy with Principes and Triarii behind them. The wealthier and most experienced soldiers were in the rear – the poorest and least experienced in the front. In front of the Hastati was a line of Velites; the weakest and most vulnerable unit of the army. They did not wear armor but carried wooden shields, javelins and short swords. Velites were not organized as units but were attached the other groups. Maniples were a subdivision of the type of infantry. Hastati and Principes had twenty maniples of one hundred and twenty men. Triarii had twenty maniples of sixty men. The maniple was a very flexible because it was isolated from the other units, allowing more movement. Each maniple could adapt to the changing pressure of the enemy force and concentrate their own pressure where needed. This offered more flexibility than the Phalanx, which was a large unwieldy configuration. In most battles the manipular formation proved superior to anything the enemy could deploy, and the Romans were typically able to destroy the enemy's center. Many times the Triarii were not even engaged. When the Romans ran into trouble it was usually due to an undersized or inexperienced cavalry. In the great battles against Hannibal, particularly Cannae, the Carthaginians were able to turn the wings of the Romans and attack the infantry from the sides. In their final battle against Hannibal at Zama, however, Scipio deployed strong cavalry to protect his wings and they were able to resist a flanking attack. The manipular formation also worked exceptionally well against elephants when the Romans created lanes for the elephants to run into so they could not trample the Roman lines. The Romans used the Manipular Formation described here until 107 B.C. when Marius made changes to the formations. The number of maniples was decreased to ten and the number of men in a maniple was increased to one hundred sixty. Marius also made the army professional, inadvertently transferring the soldier's allegiance from the Senate to the commander and paving the way for the downfall of the Republic. How were the Romans able to get past the long spears of a Greek phalanx, when they were only armed with a gladius? Flanking maneuvers? Roman armies were not armed with just a gladius. As the city expanded it encountered Greek villages in Southern Italy. Because of this interaction they picked up on the Greek phalanx. The Roman Army did not start as a manipular legion, built rather, as a Greek phalanx that evolved into a manipular legion. It is because of this that the Front lines of Romans were not just equipped with a sword, but with a spear and javelin as well. The pilum was developed to create chaos when thrown into the dense phalanx. It would bend on contact with shields and disrupt the formation integrity which was key to the phalanx strength. Gaps would open and be exploited as the more maneuverable Romans could get in close and fishish off their enemy with the gladius. Good examples of the differences can be seen in any study of the Phyrric wars where the phalanx could do well over flat ground but was at a disadvantage over rough; difficult ground.